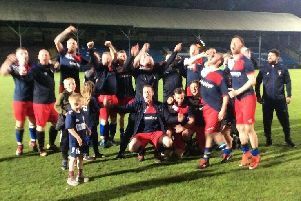 Title contenders Sowerby Bridge and Shelf United drew 1-1 at Walton Street in last night’s much-anticipated Haslem-Sheppard Halifax AFL clash. The outcome of a scrappy contest leaves United in a strong position to finish top of the Premier Division. The home side looked the more determined in their final league match of the campaign, this Saturday’s scheduled game against Denholme United having already been conceded by their visitors. Neither keeper had much to do but the Bridge went ahead in the 65th minute when Damien Watkins drilled home a Lee Wood cross. Shelf had offered very little going forward but levelled 10 minutes later when Ben Grech-Brooksbank scored after a goal mouth scramble. This brought furious protests from the home side, who claimed that a foul had been committed before the goal. The protests ended with Tom Hiley being shown a red card. Sowerby Bridge, who will face Hebden Royd Red Star in the Challenge Cup final on April 24 at the Shay, have completed their 18-game Premier programme with 40 points. Shelf United have 33 points from 14 and will be champions if they win their next three games against bottom side Calder ‘76 (home and away) and Red Star. If they drop points that could open the door for reigning champions Shelf FC, who Shelf United host at Lightcliffe Academy on May 3 in both teams’ last match. Shelf FC also have four games left and 29 points. Shelf FC Reserves beat visitors AFC Crossleys Reserves 5-1 in Division Three in last night’s other game.